At the Adams County Community Center, there is a 70’ x 270’ patch of un-mowed plants at the south end of the parking lot. Maybe you’ve noticed it, and wondered why it hasn’t been mowed. The answer to that is butterflies. As you probably know, scientists are worried about the survival of species like bees and butterflies, creatures that help our farm crops grow, and provide habitat for endangered species like the Karner blue butterfly. This patch of plants is a way we can all help. A few years ago, this patch was started as a butterfly garden by a 4-H group. Those caretakers grew up and moved on. To continue their work, the Adams County Library is collaborating with local 4-H groups to expand the plantings of native wildflowers and shrubs that are useful to bees and butterflies. This garden is just getting started. Pathways have been mowed through the grasses. Native species like coneflower, milkweed, and black-eyed Susans are being planted throughout. We’d like this space to be a park, a place where people can walk or sit, and observe the creatures and plants that live there. There is lots of work to be done. Right now, we need to remove invasive species—spotted knapweed is a big problem this year. We’d also like to pave the paths and make signs to identify the plants. We’d love to have a seating area, especially one with a roof where people can sit to enjoy the space. But that’s our long-term plan. If you’d like to help, let us know. We’d be happy to receive transplants of native species like milkweed and coneflower, but any drought- and deer-resistant flowering perennials would be welcome. Feel free to contact Erin Foley at the Library, 339-4250 with questions. 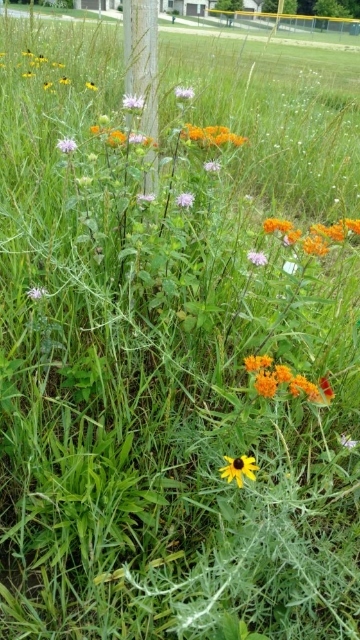 The photo above shows bergamot, butterfly week, and black-eyed Susans in bloom in July 2017.